My friend Kim is new to the sourdough world. She attended a course and was given a cup of sourdough. The recipe base she uses is nothing like what I am used to. I have a jar of sourdough in my fridge and each week I take out half a cup and feed it with a quarter cup of bread flour and water. This is the method Celia taught me when she sent me my starter. Kim’s method is to take the cup of sourdough, feed it and then remove a cup before making her bread. This works quite well if you don’t want any leftovers. I always have some fed sourdough left over – I bake a cake and a loaf of bread each weekend and some weekends I make rolls. Kim was not happy with the results she was getting from her bread and so she sent me the recipe. I made it exactly as she would the first time around and I must say that the result was not perfect. Three attempts later and we have a great loaf of bread that will last us the week for workday lunches. What nuts and seeds do you like in your health loaf? Cake flour is supposed to yield a softer loaf, but I have not tried that yet! You will not look back from using sourdough! I love sunflower seeds of nearly any variety so that’s what I’d put in mine. I can eat them plain Tammy! I’ll have a slice! Looks great! Isn’t it funny how some recipes just don’t seem to work. Fabulous looking loaf of bread Tandy. It frustrates me when a recipe fails completely as it is such a waste of money! 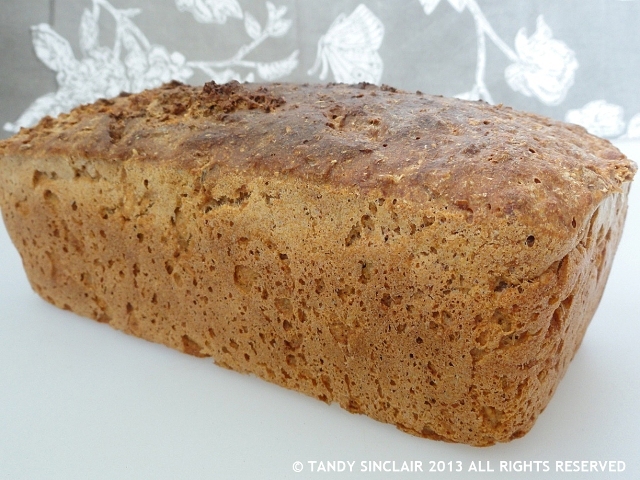 Nice loaf of bread Tandy, I love the seeds in it…I would sure enjoy this bread very much. MMMM,…your sourdough bread looks stunning! I also love dried fruits, pumpkin seeds, raisins pecans or walnuts in my bread. Ooh, I must try that!